Whether you’re staying close to home or traveling far this Thanksgiving, hopefully you’ll have some time for family fun and a bit of relaxation. 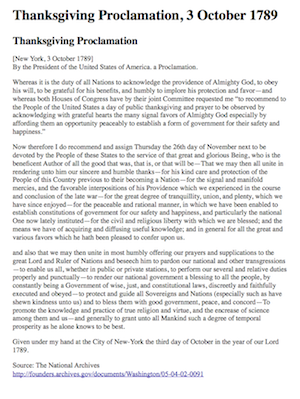 At a convenient point during our family's festivities, I'm going to pass around a copy of George Washington's Thanksgiving Proclamation of 1789. I would like my children, who are all now young adults, to read this, especially now. I say that after considering the kinds of conversations we've been having in our house in the past few months, about the election and it's results, the announcement of the President's Executive Order benefiting illegal immigrants, and the events in Ferguson. In something like an effort to make lemonade out of lemons, I take such opportunities to point out the basic idea that we must look to God, not man. Still, I've wanted to point to something that shows a better example of public discourse and leadership than what's become all too familiar for them. By my reading, our first President's words not only exemplify principled leadership, they provide advice for everyone1The history of how the Thanksgiving Proclamation came about is not only interesting, but provides additional examples of how differently members of ...continue. My study of history tells me that leaders who do not want power, who must be persuaded to serve and agree to out of a sense of duty are the most desirable. Does that sound like any elected official in your memory? 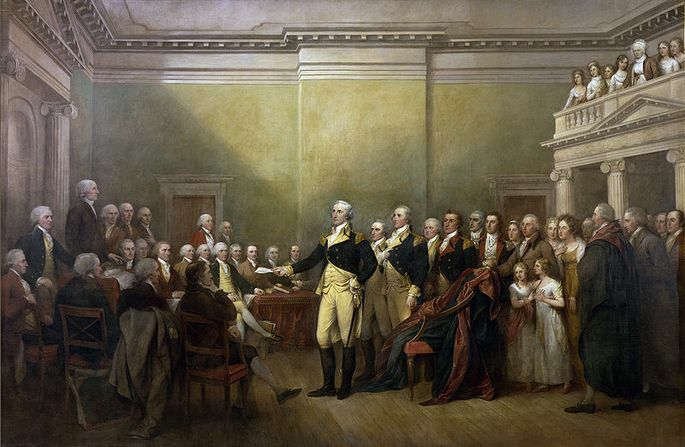 For more of our first President's example and history, I highly recommend a read of an earlier article (one of the most read on the site), which is mostly Linda's work, "George Washington: First in War, First in Peace, First in the Hearts of His Countrymen". I am so thankful that we have had such men as George Washington and their example of principles and ideals which we can still look to --- and follow, if we choose. I'm sharing a "print-friendly" PDF version of it for anyone else who'd like to pass it around. 1. 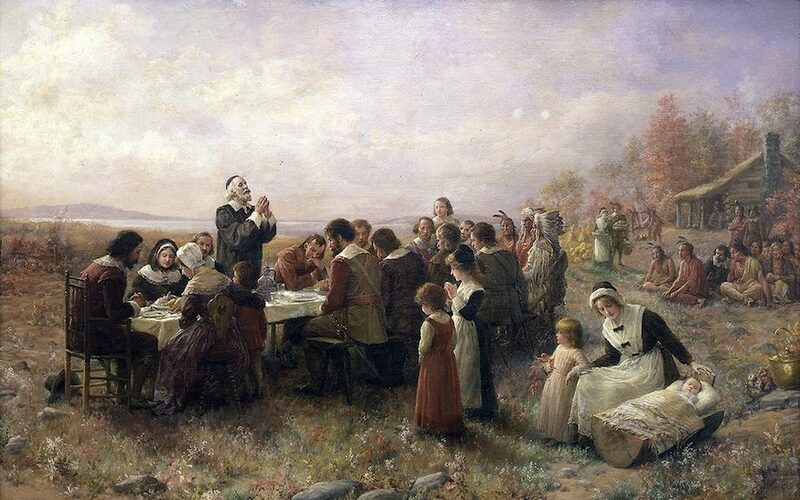 ↑ The history of how the Thanksgiving Proclamation came about is not only interesting, but provides additional examples of how differently members of the First Congress looked at questions of appropriate government actions. 2. ↑ This was the motto of the Society of the Cincinnati, an organization of Revolutionary War officers, formed in 1783, for which George Washington was the first President.